Writers (Spy Fiction, Thrillers and Science Fiction) and addicted to flying! 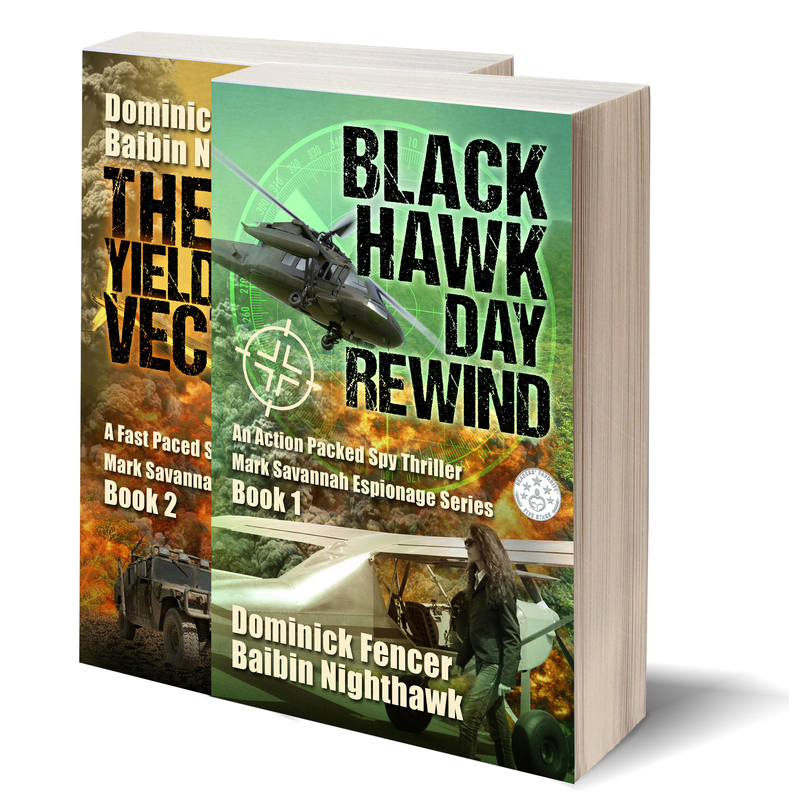 The novel, Black Hawk Day Rewind by Dominick Fencer and Baibin Nighthawk, centers on the life of Barnett Cooper, a reluctant British agent who finds himself being hunted by the beautiful CIA agent, Anaïs Degann. Barnett’s father was a military man and he grew up resenting his father and his frequent absences from the family home. Barnett wanted to be a doctor and his father wanted him to follow in his footsteps. When his father died, Barnett goes on to medical school and fulfills his heart’s desire. On a university exchange program in Argentina, he meets Professor Zimmerman and his life takes a completely different path. He becomes Mark Savannah and is thrust into the clandestine world of espionage. Then he comes face to face with assassin Anaïs and discovers a sinister secret deep within the CIA. Black Hawk Day Rewind is a fast paced thriller that is bound to keep you reading until the wee hours of the morning. Written by Baibin Nighthawk and Dominick Fencer, the story is obviously well researched. From a seemingly normal household, the plot brings the reader into a world engulfed in secrecy, betrayal and violence. The world of espionage, however, also offers friendship, loyalty and love. As Barnett Cooper undergoes a metamorphosis and becomes Mark Savannah, there is a sudden but smooth shift in the tone of the story. The characters in the story are well developed and each of them is quite interesting. This is a novel that will turn a boring day into a thought-provoking one as we follow the life of Barnett Cooper alias Mark Savannah, student, spy, lover and psychiatrist, as he tries to confront his past and at the same time find happiness in life. "Once again, Baibin Nighthawk and Dominick Fencer delivered an epic spy thriller guaranteed to give lovers of the genre an amazing reading experience. The High Yield Vector (Mark Savannah Espionage Series Book 2) is the ultimate making of spy stories as they should be told; espionage, greed, and the ultimate clash of intelligence agencies. Although the book is spy-themed, which it delivers excellently, it also honors the selfless dedication of humanitarian workers who constantly risk their own lives and give all they can to deliver desperately needed aid to those - especially in third world countries - whose lives have been devastated by poverty, disease and war." (Mark Savannah Espionage Series Book2). Former British intelligence agent Mark Savannah escapes the international arrest warrant hanging over his head by taking refuge among the Tuareg of Mali. In 2008 the resurgence of fighting in the North of the country causes him to change his plans, forcing him into hiding in the Democratic Republic of Congo where he works undercover as a doctor. As he tries to survive the widespread corruption in the country, Mark witnesses the devastating and deadly effects of a transgenic plant project and again faces his mortal enemy, finding himself at the centre of a clash between several countries’ intelligence services as they fight for control of the territory and its markets. The High Yield Vector: A Fast Paced Spy Thriller.